This non-magnetic MRI release lever is constructed entirely of non-ferrous materials. It is specifically suited for use in MRI rooms. All materials including fasteners are either non-ferrous materials or special polymers. 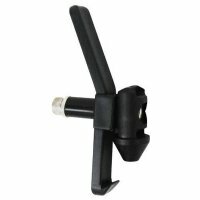 Replacement release lever assembly, complete with mounting hardware for MRI wheelchair flip back arms.